One of my recent tasks was it to re-design some bound and unbound tabs, as there was feedback to them being too large and to also align them to the 8px grid. I first reached out to other design teams to hear from them what it is they need and to review with them any of their design solutions to tabs. Then I checked out the tab component on other websites and in other design ui kits. From there I created my unbound and bound tab solution. I build it all in Sketch, where each tab is a symbol that can easily be implemented and the text overrides make it easy and quick to use. I made a few short videos to show you how simple it is to build some tabs (see below). The biggest update I made was to the unbound tabs. Before they didn't have a line that connected them and they seemed to just float on the page. There was some feedback that people didn't recognize them as tabs. 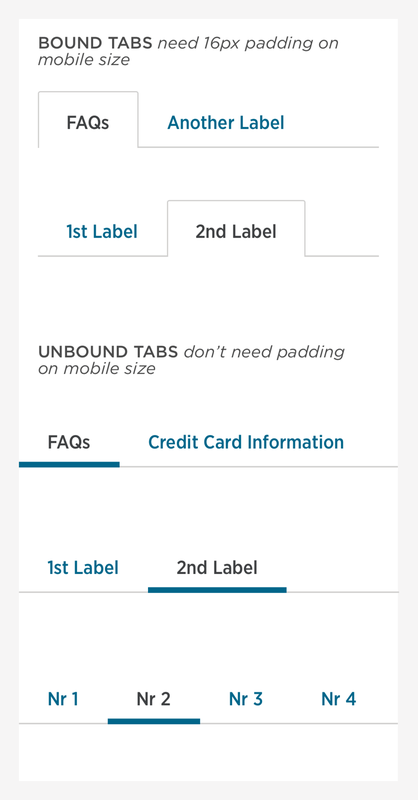 I left aligned my unbound (as well as bound) tabs and added the 1px gray line. By adding the line we now draw a distinct separation between the tabs and the content below. The tabs don't seem to be floating on the page but seem anchored to the line right below them.